An Alameda County Fire Department Battalion Chief had to receive emergency re-constructive surgery after being attacked by a pit bull at the scene of a house fire Saturday morning. On Monday, the family who owns the pit bull is "praying for his recovery." Firefighters put out a fire and evacuated a home on Maubert Ave. in San Leandro. 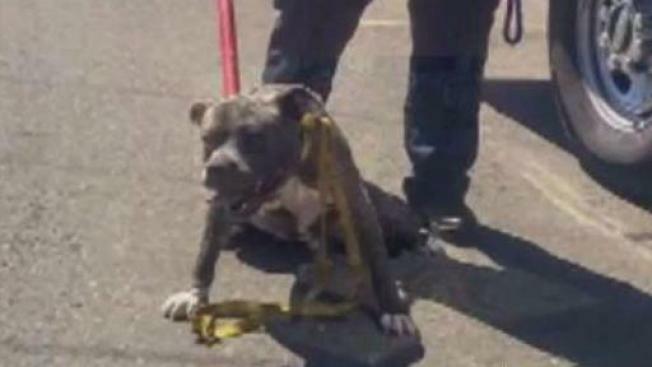 They discovered several dogs on the premises, most of them pit bulls, according to Alameda County spokesperson Aisha Knowles. Battalion Chief John Whiting, a 20-year veteran firefighter, asked one of the residents whether the pit bull she had on a leash was dominant, Knowles said. "He was on a leash, he was the only dog out of the 20 dogs that was on a leash," said Division Chief Alan Evans. "He proceeded to ask a couple questions. She said 'yes' then for whatever reason the dog jumped up and attacked our battalion chief." The attack lasted a while but the dog eventually stopped. Whiting was rushed to Eden Medical Center in Castro Valley to be stabilized, then transferred to Stanford Medical Center for surgery. "Just goes to show you that first responders, firefighters, it’s a very dangerous job, you never know what you’re going to get into," said Evans. Two dogs were killed in the house fire and 18 others survived. It wasn't immediately clear why there were at least 20 dogs on the premises but all were taken by Alameda County Animal Control. The dog that bit the officer was quarantined and the Alameda County Sheriff's Office has begun an animal neglect and cruelty investigation. The family, which is now homeless and traumatized, are not only worried about their future, but they also are praying for Whiting's recovery. "It’s an unfortunate situation. I think it was everybody’s heart was in the right place doing the right thing," a family member said.